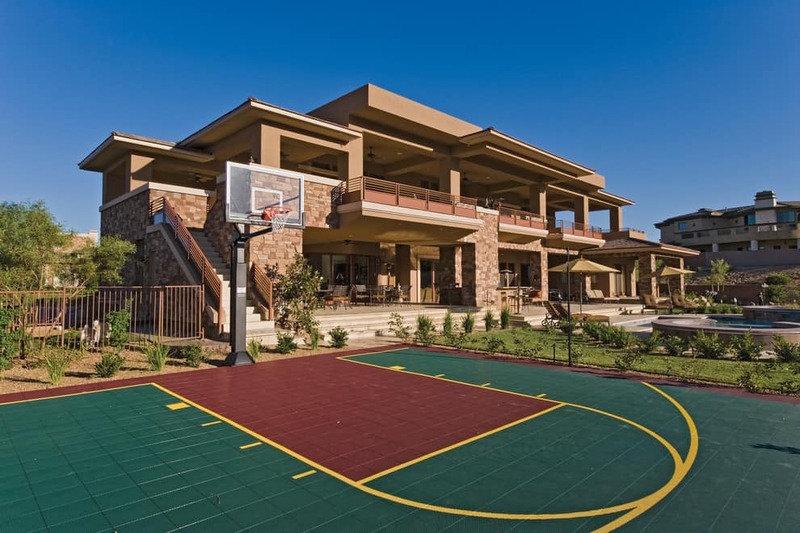 Have you dreamed of having your own basketball court in your backyard? 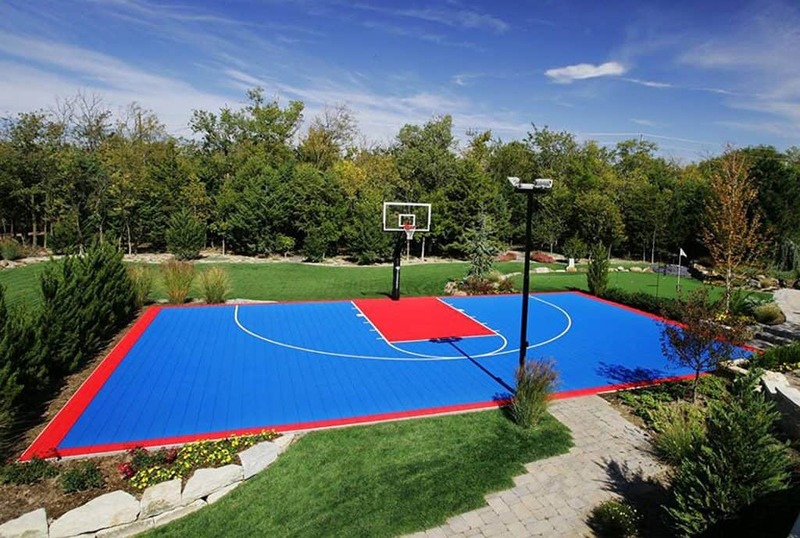 Well, with help from this article, your Basketball Court Ideas into a reality! 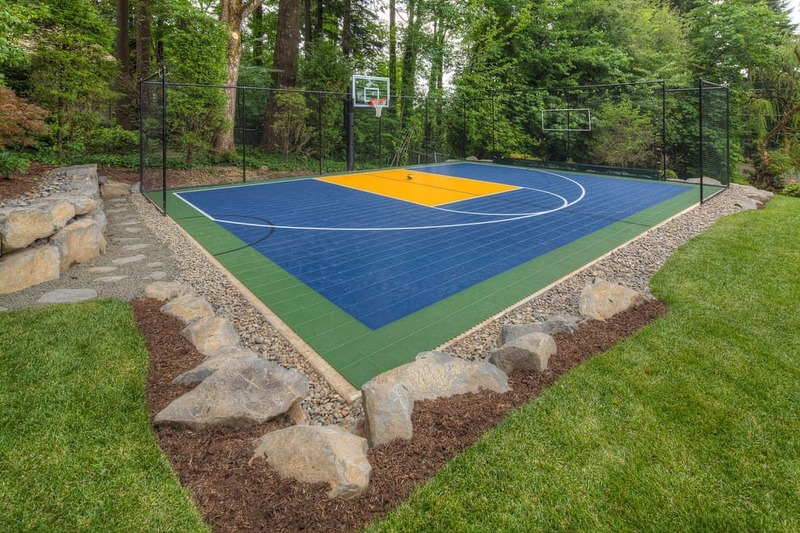 A basketball court stencil is necessary to build your dream court with the proper dimensions. You do not want to paint lines that are not accurate in size or scale. It will make pick-up games much easier and practice for real games possible. Without proper stenciling, it can be almost impossible to play the game correctly. If the three-point line is too close the score will not be accurate. If the foul line is placed too far back, many free-throws will be missed. 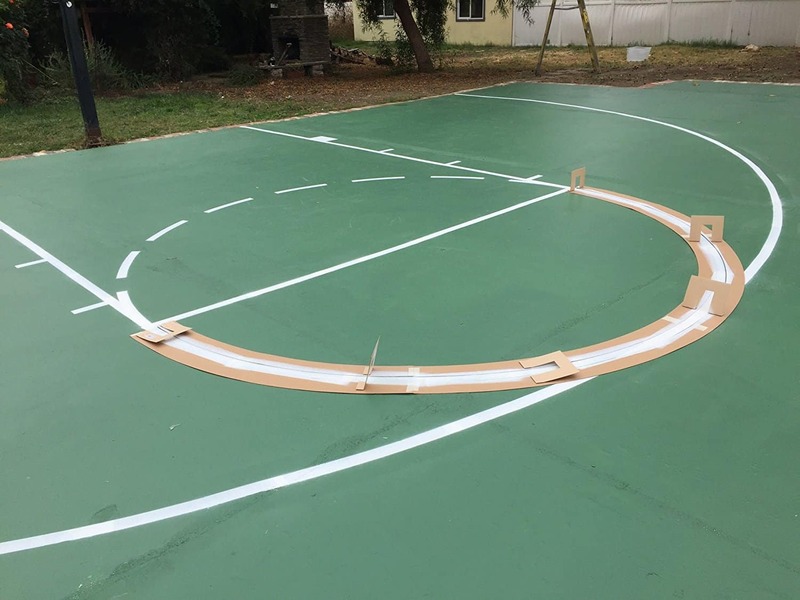 Through sites such as Amazon, it is possible to buy do-it-yourself basketball court stencils that will quickly and accurately help outline a basketball court in minutes. 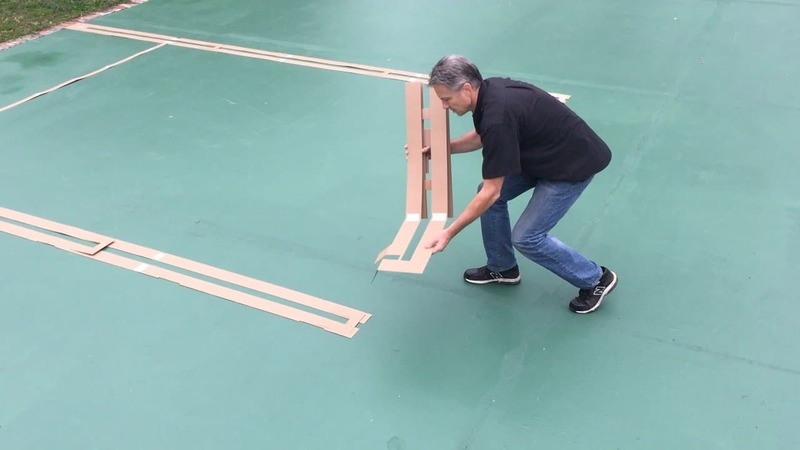 The basketball court stencil kits are usually pre-cut, so the only instructions are to unroll the stencil onto the area you wish to be the court, grab paint, and go! It will work on any surface, concrete, asphalt, or wood. Not only will this help players who are interested in competitive play, but it also encourages young children to pick up a basketball and learn the fundamentals of the game. 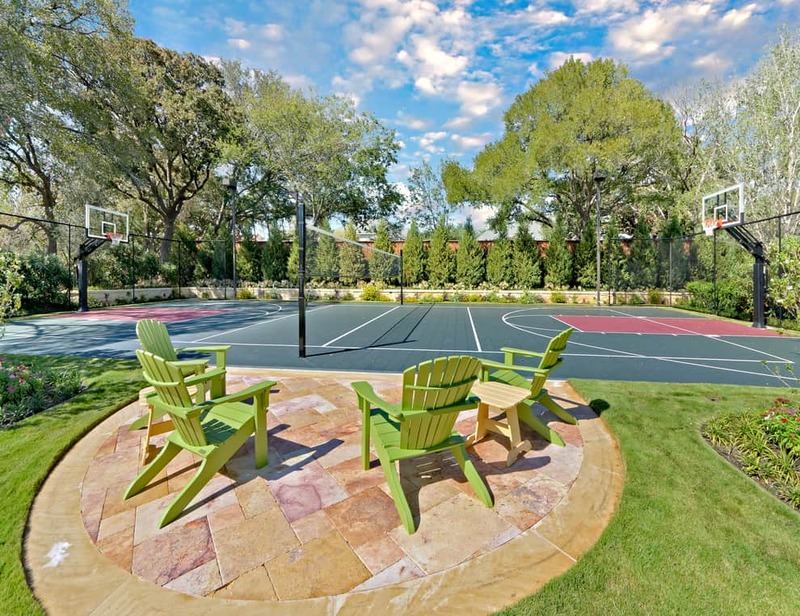 While many of the pre-cut basketball court stencils are about 13 by 21 feet or one-half of a college court, it is possible to find larger and smaller stencils as well as reusable stencils if painting a driveway permanently is not a possibility. Because of the popular nature of this sport, different stencils exist but remain “dimensionally” similar. Obviously, a stenciled court will not be official NBA size, but more along the lines of college or high school. 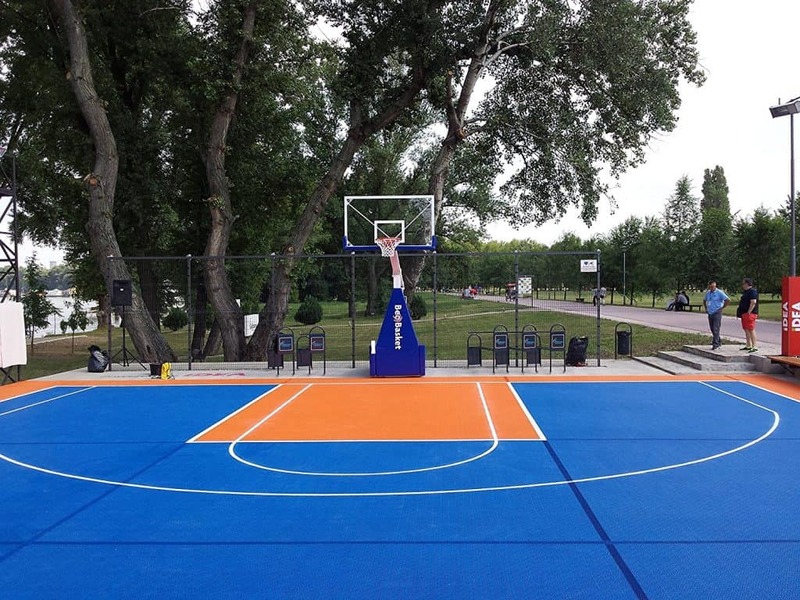 With the help of a basketball court stencil, players will have the ability to gain a deeper understanding of the dimensions of the court, where they can and cannot dribble the ball, and the approximate amount of power needed to shoot a foul shot or three-pointer. 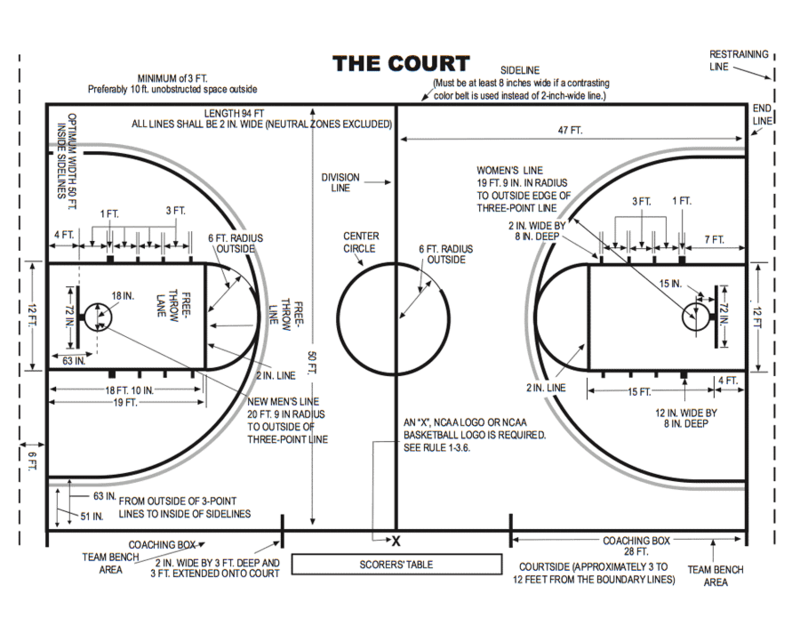 In order to accurately and effectively play the game of basketball, you must understand the basketball court layout. The rectangular boundaries which indicate out-of-bounds, the center circle where jump balls take place, and the “paint” are all specific areas of the court which contain certain rules. Understanding these areas along with the others can help a coach to draw up plays during the game, players to get the most out of their game, and it also keeps fans from getting injured. So, not only does the layout help coaches but players as well. The layout is quite straightforward, as different colored paint and lines help to divide the court into its playable areas. In the middle of the court is a painted circle, about 12ft (3.6 meters) in diameter where games or halves are started. Both the home and away baskets are identical, which a three-point arch, a restricted area also known as the “paint,” and the hoop in the middle about 4ft (1.5 meters) in front of the out-of-bounds line. The “paint” is the painted rectangle under the hoop and the player who has control of the ball may only stay in this area for three seconds before a foul is called. 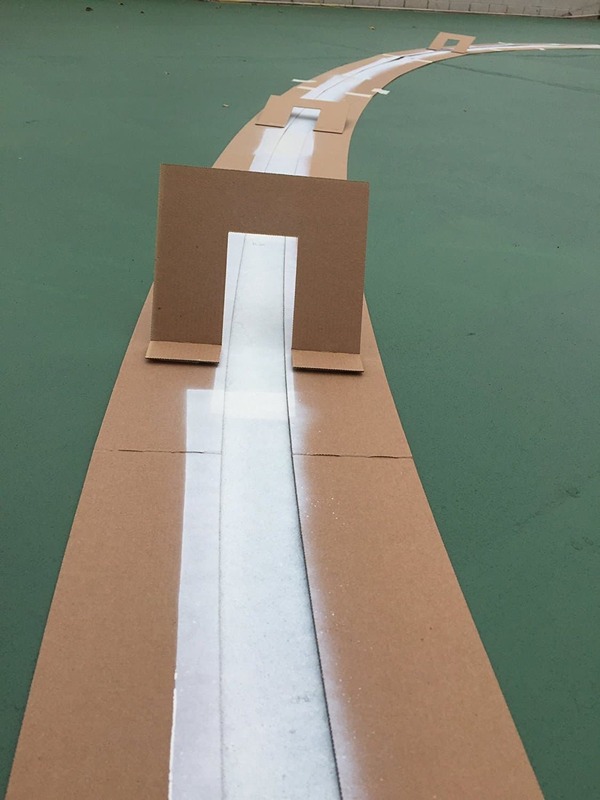 The foul line, which is at the end of the “paint,” is about 18ft (5.5 meters) away from the hoop, and is used when a player commits a penalty. Within the three-point arch and the “paint,” a player may shoot a basket but is only worth 2 points. The game of basketball is equal parts mental and physical, which may come as a surprise to many of you. Learning the dimensions of the court, which areas may produce the greatest amount of baskets and how to strategize a play can mean the difference between winning and losing a game of basketball. In order to accurately play and coach the game of basketball, it is important to understand a basketball court diagram. 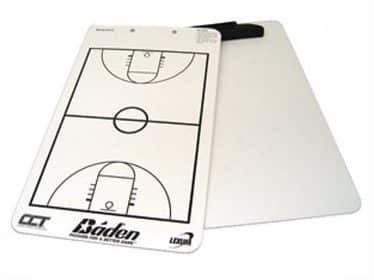 Usually, a coach will have a clipboard and a dry-erase copy of the basketball court, which they can then use throughout the game to work out plays and strategy. Most of the time, a diagram is used to create different offensive and defensive plays during the game to outwit the other team. As well as create plays, the diagrams can also be used to show substitutions, areas of concern or measurements to help players shoot the ball with greater accuracy. 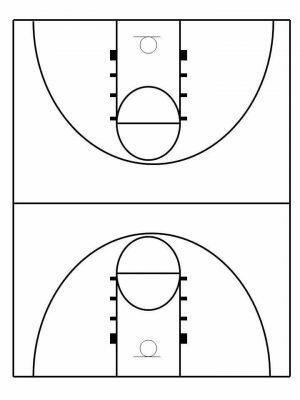 Because of the competitive nature of the game, it is very important that players and coaches alike use the basketball court diagram to their advantage. To expand on the mental side of the game, you should think of the diagram as a board game then determine possible outcomes of your team as well as the opposing team. During practices, the teams must create game-like situations using a diagram like the ones pictured here, and reenact possible outcomes to better defend their own net. Dimensions of basketball courts depend on the skill level and age of the athletes playing the game. Beginning at the elementary school level, courts are approximately 74 feet in length and increase in size up to 94 feet for professionals in the NBA. As the length and width increase in size, so do the different areas of the court such as the “paint” or rectangle under the basket, or the three-point arch. Each school, college, or professional team sport their own colors which can further confuse opposing teams as they are not used to certain patterns or colored lines. 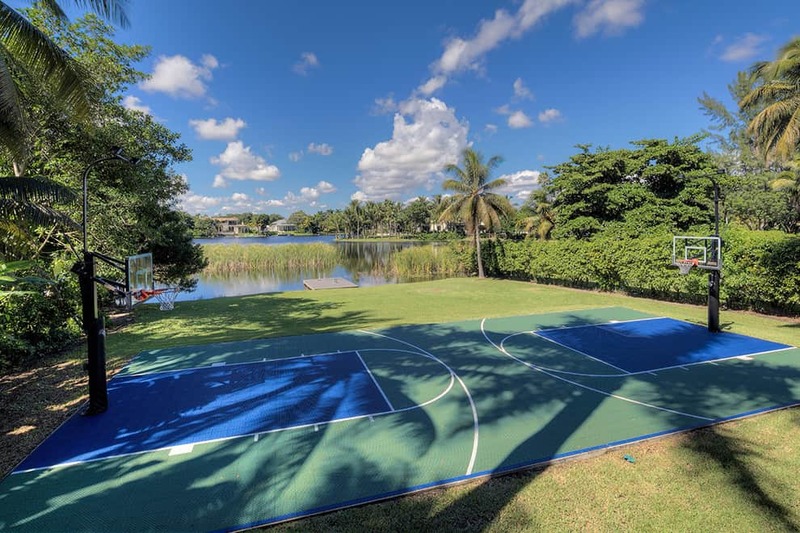 As a large audience began watching and the playing basketball, it quickly became apparent that children and teenagers could not compete on NBA-sized courts (94 feet in length) for reasons such as height and strength. 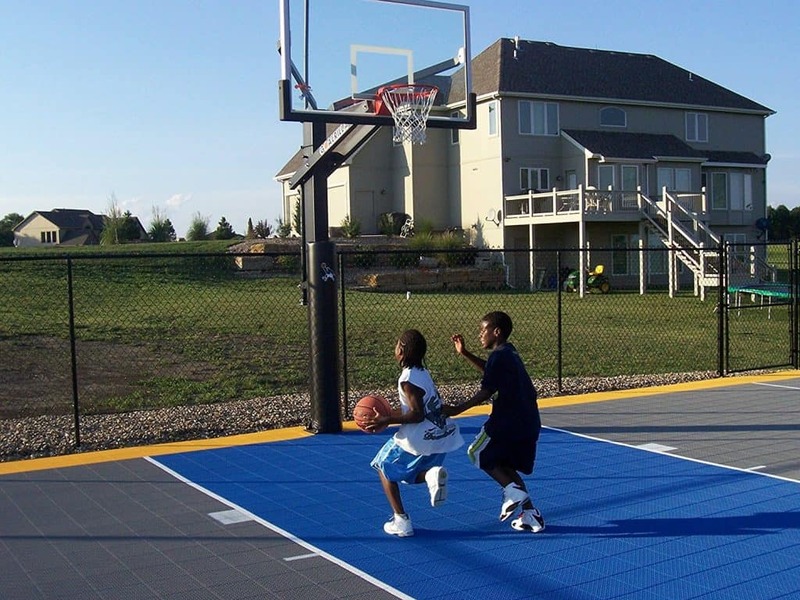 Because of the popularity of the game, many rules and regulations such as standards for the dimensions of basketball courts have been put into place. Junior high school courts are about 74 feet in length, while high school courts are approximately 84 feet and college courts are full sized 94ft. For the adult who enjoys pick-up games with their friends, a high school sized court will suffice, as the skill and ability levels are not honed to professional standards. It is also important to understand the height of the basket, as this can become a factor in outscoring your opponent. Standard hoops starting at the elementary level are 10 feet high, often leading to low-scoring games until high school. Extracurricular sports, especially basketball, have a great impact on young minds. Many people do not know that high school basketball court dimensions differ from those seen in the NBA or even in college. This is due to the fact that many students are still growing during their tenure, making a full-size court very difficult to play on. Basketball is just as much an individual sport as a team sport, with a coach designing plays, mediating disputes, and providing advice to his team. The players training on their own and using their skill to play their position well their teammates. Much like a business, everyone must do their own part, work together towards a common goal, and receive advice or criticism from their boss (the coach). It is very important to understand the boundaries of a profession as it is important to understand the boundaries of a basketball court. 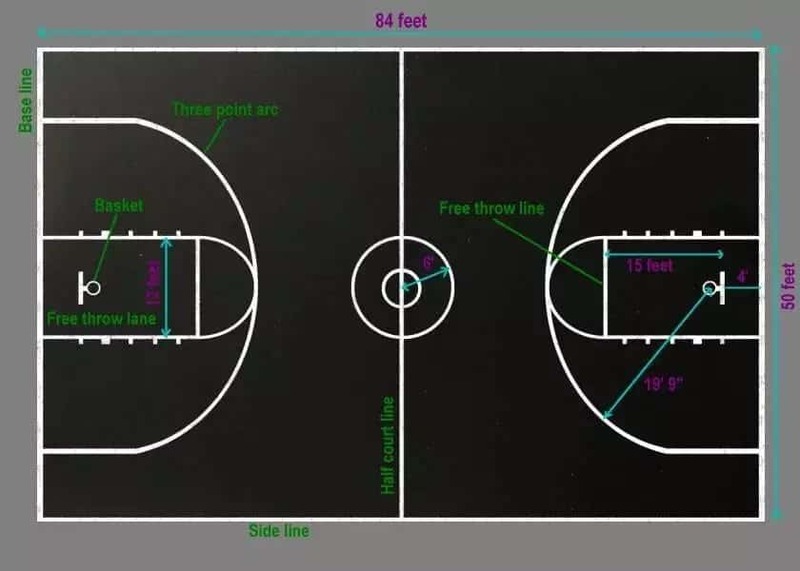 84ft (25.60 meters) by 50ft (15.25 meters) are the standard high school basketball court dimensions, which is somewhat smaller than an NBA court, but the ratio of length to width is still the same. 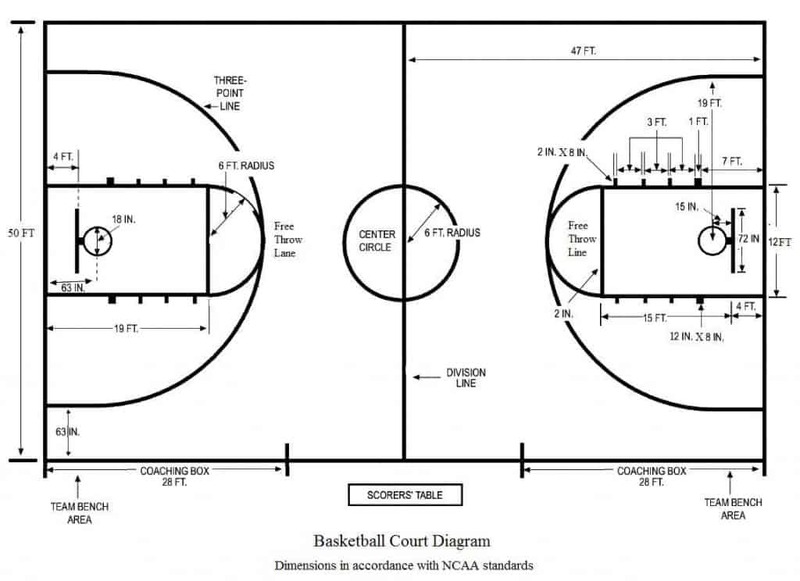 College basketball court dimensions are the same size as the NBA, which differs from high school, junior high, and elementary courts. Not only because of the size of the players but also to increase the difficulty of the sport. 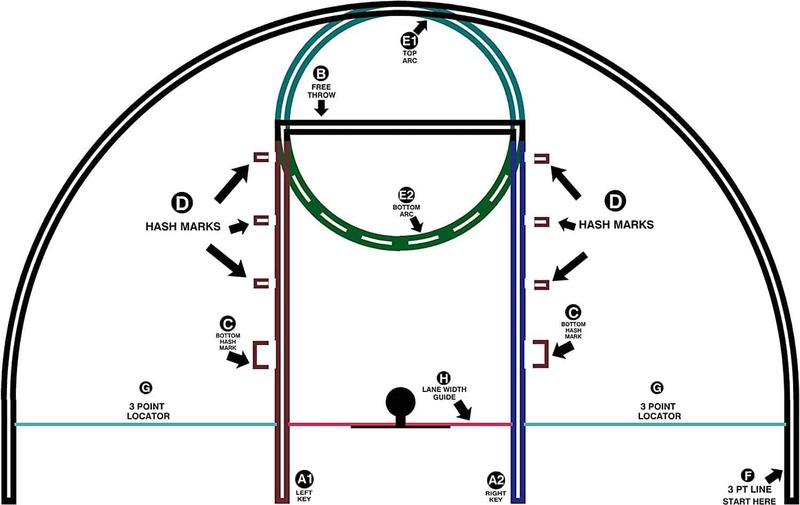 All interior markings, the three-point arc, free throw line, and the center circle are all the same, but the length and width are changed depending on the playing level and country. In the United States, the college basketball court is 28.65 meters by 15.24 meters or 94 feet by 50 feet. I hope this article helped you to better understand the dimensions of a college basketball court and why different leagues such as the NBA or international teams have similarly scaled courts. 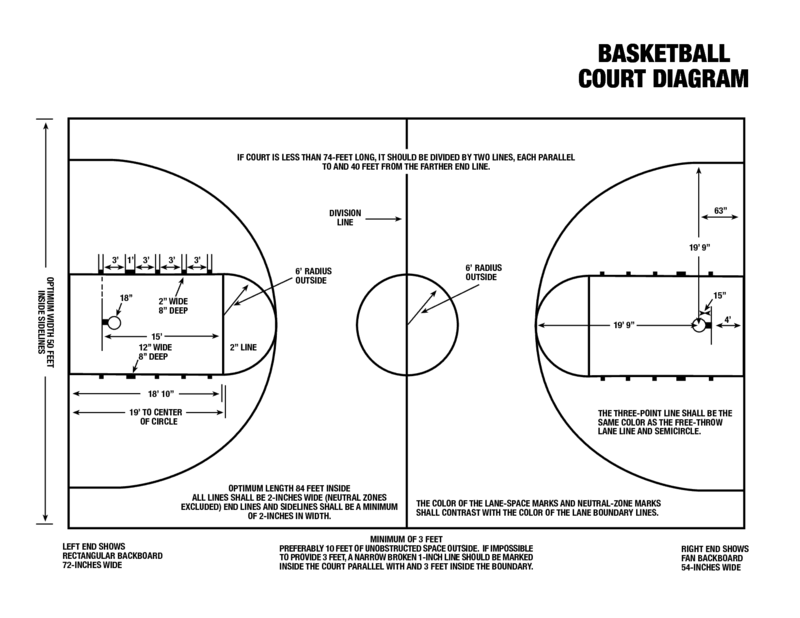 I hope you’ve gained a deeper understanding of the basketball court diagram and basketball court stencil, as it is just as important as practicing free-throws or three-point shots. With the correct amount of physical practice and mental planning, it is very likely you will succeed at learning and playing the sport well. 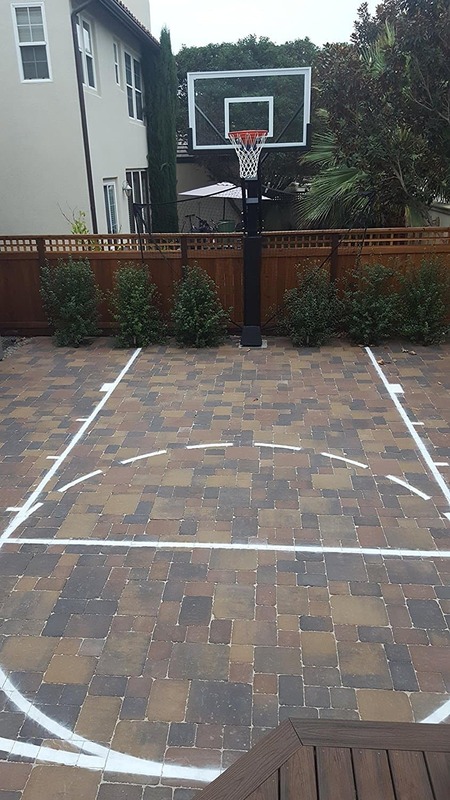 If you have any other questions about the game of basketball and making your own backyard or driveway basketball court, please feel free to leave a comment below. What are the dimensions of a kid-sized basketball court? Elementary school/Junior high school courts are about 74 feet in length, while high school courts are approximately 84 feet and college courts are full sized 94ft. What are the dimensions of a high school basketball court? The high school basketball court dimensions are 84ft (25.60 meters) by 50ft (15.25 meters). What are dimensions of a College Basketball Court? The dimensions of a college basketball court are 28.65 meters by 15.24 meters or 94 feet by 50 feet. From the free-throw line to the hoop, it is about 15 feet, and another 4 feet from the hoop to the baseline (out-of-bounds). From the basket to either side of the three-point arch is slightly less than 20 feet, at 19 feet 9 inches. The “paint” area is 12 feet wide, and the radius of the center court circle is 6 feet. What is “the paint” on a Basketball Court? The “paint” is the painted rectangle under the hoop and the player who has control of the ball may only stay in this area for three seconds before a foul is called. The foul line, which is at the end of the “paint,” is about 5.5 meters away from the hoop, and is used when a player commits a penalty. Within the three-point arch and the “paint,” a player may shoot a basket but is only worth 2 points. The game was invented in 1891 by Dr. James Naismith, who would be the first basketball coach of the Kansas Jayhawks, one of the most successful programs in the game’s history.